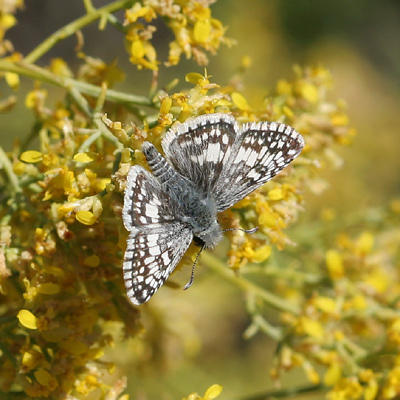 Some of the most challenging butterflies to identify are the Checkered-Skippers (Pyrgus spp. ), such as this male Common Checkered-Skipper (Pyrgus communis) I observed here in Tucson last October. Common Checkered-Skippers are similar to Desert Checkered-Skippers (Pyrgus philetas) and almost identical to White Checkered-Skippers (Pyrgus albescens). In fact, Common Checkered-Skippers and White Checkered-Skippers are so similar that the only certain way to positively identify them is to dissect and examine the male genitalia. 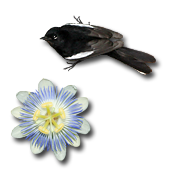 Males of all three of these similar species have blue-gray hairs on their backs and dorsal wing surfaces. However, there is one subtle difference between the males that allows a probable field identification to be made. The black checks on the white wing fringes of male Common Checkered-Skippers often only reach halfway to the edge of the fringe, as can be seen on the hindwings of this particular butterfly. 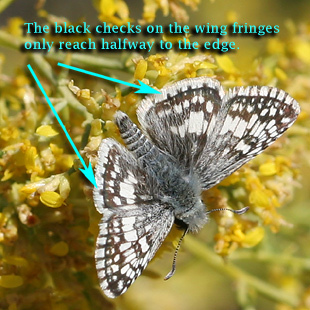 The black checks on the white wing fringes of male Desert Checkered-Skippers and White Checkered-Skippers usually reach all the way to the edge of the fringe. Common Checkered-Skipper caterpillars feed on plants in the Mallow Family (Malvaceae), while the adults feed on the nectar of a variety of flowers, especially those in the Aster Family (Asteraceae).